I don't see any difference because when I replaced the speakers of my First Gen Ertiga too they were same as shown in the images. Many years before when I replaced them for a friend's first Gen Swift too the speakers were of inferior quality. I am yet to check what Maruti offers in Ciaz though as the system sounds quite OK which also should be due to better outside noise insulation though. 1. Economy : The mileage stands at 11.3 kmpl with a combo of city and highway conditions . I expect it to go up further. My first gen used to give 13.5 kmpl after the 10k mark with City highway driving . 2. Noise : Smooth drive and the new suspension works well. Felt a little bobbing only on rough patches . I have taken the car till 80-85 kmph and found that engine noise filters in post the 80 mark. It's not irritating but can be heard if the stereo is off. 4. Brakes : The new gen definitely has spongy brakes. I hope it improves over time. It does feel weaker then the previous gen.
5. Space : The space on offer is pretty much the same until the 2nd row. Boot has improved but not a whole lot . It depends if the 3rd row passengers need to recline their seats. Overall flexibility has increased with the recline and hidden compartment . This can be removed for taller trolley luggage. 6. Load carrying : I have taken 5 passengers so far on slight inclines and highway. No fuss form the engine and it's pretty complaint in most conditions. I haven't tried with a full house plus luggage . 7. Smart hybrid : Mostly a fancy feature. It's fine in medium traffic but gets a bit irritating in stop and go. Better to turn it off during that time. The feature resets once the car is turned off and on. So each time you will need to turn it off . 8. Music system : Sound quality is above average (4 speakers + 2 tweeters) and the touch interface is great for the most part. BT pairing is seamless and all features work as expected. 9. Accessories : The window chrome looks best on darker shades. The interior styling kit looks great with the maple wood finish. It's pricey at 7500 INR but gives the interior a nice look and breaks the monotony of beige. PVC matting along with fabric mats (Black) further reduces the sea of beige inside the car. The highlight of the car is the ease of driving . Super light clutch coupled with seamless acceleration makes it very easy in city conditions. Only the length of the vehicle needs to be taken into account . Parking sensors and rear camera is a must for this vehicle . These are purely my observations and my point of view. Last edited by keshav1426 : 13th April 2019 at 20:36. Body kit : It really enhances the look of the car . On the grey color , most of the bulk is hidden and it gives it a low slung look. The ground clearance isn't really hampered. I would assume a 5mm difference . I have taken it over speed breakers and pot holed roads without any problems . Another aspect is that the body kit is made of flexible abs plastic. I don't expect it to withstand hits bit light scrapes won't harm it . Mobile holder : I have used Tagg Magnetic holder for my previous cars . I ordered the same for my Ertiga and it works like a charm . It is a highly recommended product and can be fixed on the dashboard or on the winshield . The mobile stays firm with magnets attached . Magnetic sun shades : Can be bought from Amazon. One particular seller named Hi Art provides a 7 piece unit which includes rear winshield. Fit is 90% ok and serves the purpose very well . It is definitely needed keeping in mind the green house on offer. MID : We can change the settings for door lock ( single press on the key fob to unlock all doors ) and also minor things like the display color . Easy to navigate and changes reflect instantly. The above is just to help fellow owners and I have no personal benefit out of the information provided. Last edited by keshav1426 : 13th April 2019 at 21:47. Sorry to be dramatic but got a bunch of scratches on my car, near the right rear wheel arch/door ridge. My Ertiga is around 3 weeks old. I scraped against a wall while driving down a spiral parking lot. Just a glance was enough to put lot of parallel lines. I will attribute it to graduating from a hatch back. 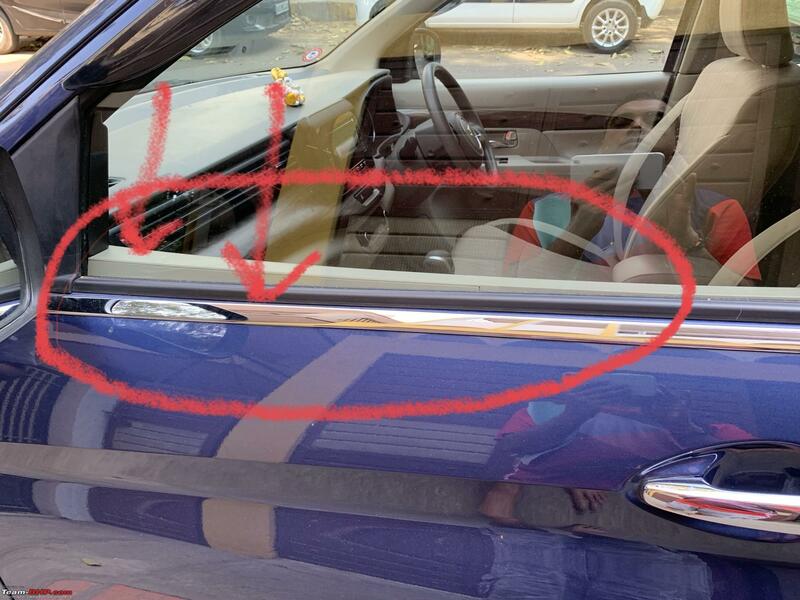 There is no cladding provided by Maruti, hence I have planned for following action: apply some protection coating. Install wheel arch flares/protectors - there are some generic ones on Ali Express. Apply 3M PPF at strategic places. I checked with 3M about their coating. It costs 26k, with top up application 4 time, every 3 months and typically lasts 15 months. Whereas the dealer Bimal offers what they call "ceramic" coating for 16k with 3 top-up coats for 18 months. Which according to you will be a better option? The same happened to me. A new Santro was parked horizontally behind me and I scraped bumpers with it . Luckily I just needed to rub it alittle and the scratch vanished. I suspect it was the paint from the other car. I planned to do 3M ppf for bumper corners. I have done this on my wife's car and it's quite effective against scratches and scrapes. You don't need to do the entire bumper, just the edges and it will cost around 8k. Additionally door edges can be done as well at a cost of 500 INR from 3M. On top of this ,you may also add bumper protectors which you can get from the dealer or aftermarket . All this together should be able to protect your car to an extent . For your body scratches, please rub it with colgate toothpaste and some of it will come off. It works best on white cars. Last edited by keshav1426 : 16th April 2019 at 19:15. Looks good but i am hesitant to put that money. Yet to install the car seats but I will probably go for MGA premium art leather seats - found one which seems good. Has anyone noticed the front door window inner padding not in alignment with outer lining? Not sure if it just my car or general “as designed” feature ? Actually its the case with lots of cars, the old Honda City too had the same. 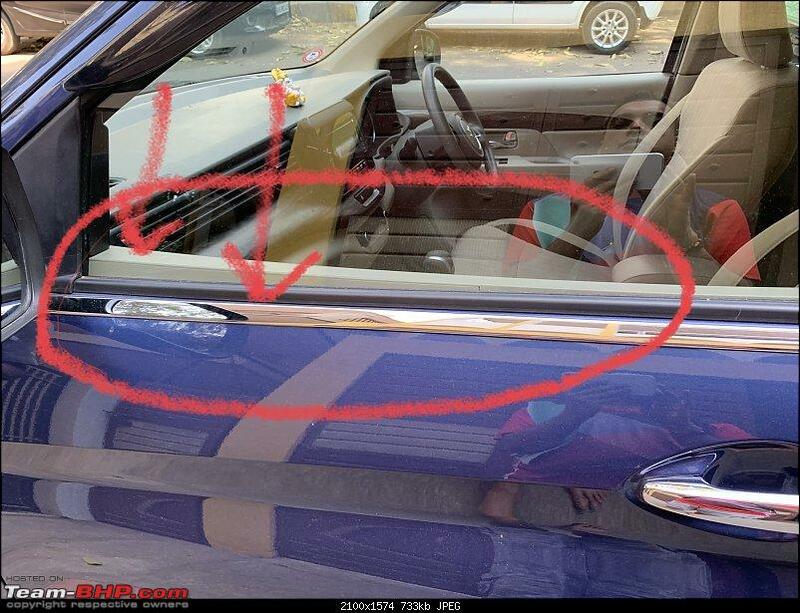 The typical Maruti rattle has started I guess, my car's rear windows rattle like state transport bus when partially rolled down. My guess is that the sheer size and weight of the glass is the main reason, her first service is due this week so will show them, its a major irritant. Something prospective owners should take a note of. Would like to hear from other owners too. As Keshav1426 mentioned, at 700 kms, I don't think the brakes have improved much, they are definitely spongy, and lack the bite that our Linea offered even at 78,000 km. I had a few situations initially where my leg was trained to apply a certain amount of force in my old car but realised that its not enough and had to push harder at the last moment in the new one. Not sure if switching to better brake pads would improve it. Got to know that the Baleno has similar traits. For people concerned about automatic stop start affecting AC, the car restarts on its own whenever it wants to turn on the AC compressor (Not sure if its the same for V models having manual AC). I came to know about this while driving yesterday afternoon in traffic. Not very happy with the sound quality of the music system, though now I prefer listening songs on good quality headphones when alone, its a shame that our old Brio sounded much better than this. At low volumes, say your baby is sleeping in the car and yet you want to listen to some music while driving, you will hear only boomy bass and some high notes, mids are completely gone. Audiophiles will definitely upgrade speakers if not done already. Drove the car in rains last week, the wipers do a good enough job but the quality appears to be poor, I saw one streak of water already.